Every outfit post can't just show you the perfect. As much as I love to doll up for the camera, I find it important to share the less than perfect photos with you too. Maybe to set an example for some of my friends and bloggers to just do it. Don't wait for the mood to strike you, don't put off blogging until you get a better camera: just get out there and do it. It's really simple. Dress, document and share. I had 20 minutes until I had to leave for work yesterday. It was 1 o'clock in the afternoon, the absolute worst time to take photos. Since I was short on time, I didn't have a minute to spare to scout out or search out a pristine location. These photos were shot in the less than lovely back alley behind my apartment. The alley is weedy, shabby and over grown. And still I find all sorts of things to inspire me. 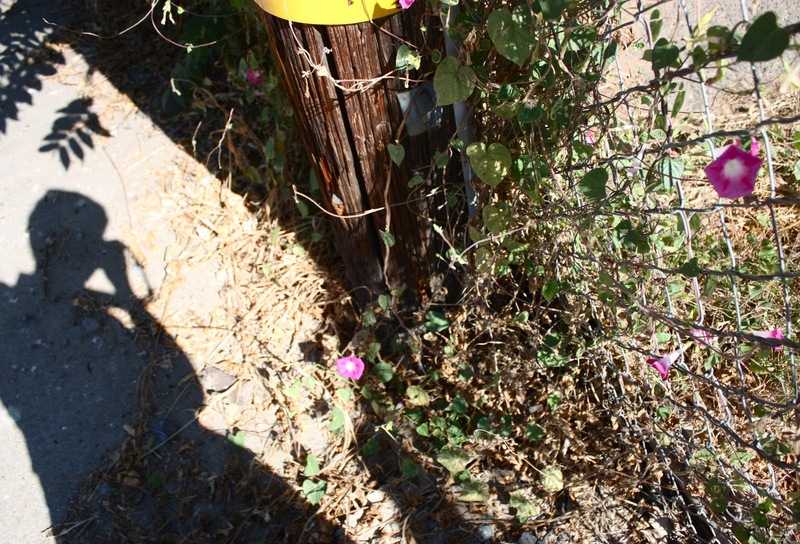 Like these weedy pink morning glory winding up a telephone pole. No water, barely any soil, and still an abundance of bloom. There was even a morning glory plant sprouting out of a crack in the cement! Nothing but nothing can discourage life. I too, perhaps am a weed. I don't always find myself in ideal situations, but I always make the best of it. My wardrobe is overflowing with bright and patterned second-hand clothes. I am a stranger to "it' bags, expensive shoes and designer labels. And still I flourish. This is me in my outfit that I wore to work. The photos are over exposed. The outfit is super casual. The highlight is my rad new glittery gold tote bag that I got recently from my dear friend Jemina, who sent this to me from Singapore! What a lovely and thoughtful gift, girlfriend! Thank you so much! So fa apart and yet so alike.As you know by now, I do share the love for colours and their imposible mix and matches. I couldn´t agree more with you about making the best even in the worst conditions. Nature is always a good reference to all of us. About your outfit, I love it all: the blue dress with flowers, the idea of using a kimono as a jacket (I love it), the bag...Well, as I said, everything. Un abrazo fuerte y mil besos. 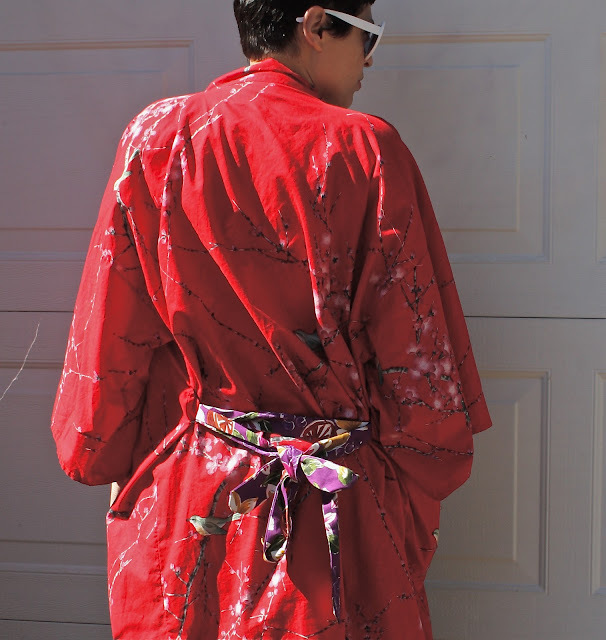 The kimono looks like it belonger to an artist- one who paints life on canvas. The first image is fabulously colourful which I adore. is like 2 hours from sf to sac no?or something like that? crap, Isquisofrenia! I work today until late tonight. Sac is 1 1/2 hour drive (in good traffic.) One of these days, we must meet up. Next time you visit SF, perhaps? You sure know how to put together a fun outfit!! I love the way you mixed the patterns from the dress and robe and that bag is awesome. Thanks for your comment today! I really need to start inspiring myself. Maybe to begin with a new attitude would work:) And yeah my hair looks like that if I don't wash it for a couple of days. Kinda gross, but whatevs. Crazy good style. Love the glasses. again I would like to say that you look so fabulous that I just can't take my eyes of you (hope it doesn't sound weird or so...). i am in love with your dress, and jemina sent you such fabulous bag! You are so great at mixing prints and making it look stunning and not silly. I admire your courage! "I find it important to share the less than perfect photos with you too" Kinda love it. That red kimono is pretty fantastic too!! I think that first photo of your kimono is one of my favorite of your photos so far. And I really like your outfit! Keep it up. I absolutely LOVE that dress and the kimono is perfect with it. That kimono is incredible! I love how you paired it with the floral dress and the fun shades! Thank you friends. So nice to come home from work to this lovely queue of comments. I tell you we all should wear kimonos more often! They are super comfy, silk or cotton make perfect lightweight jackets and add flair to everything. I love the less than perfect photos... that kimono is stunning by the way! Head on over to my blog, I am previewing my new headband collection! See I thought the photos were good, not less-than-perfect at all. Natural light falls in wonderful patterns and your kimono looks so gorgeous in it. I must say 'Thank You' for the wonderful comment - it made my day, no make that my year. I hope Ms Hepburn would approve :) We both were born and bred in India and have lived in NZ for the past decade so you were spot-on! I love that bag, Jemina. It reminds me of wonderful YOU. You're welcome MarchMuse. You are very Audrey Hepburn to me. You are like a weed, remember? 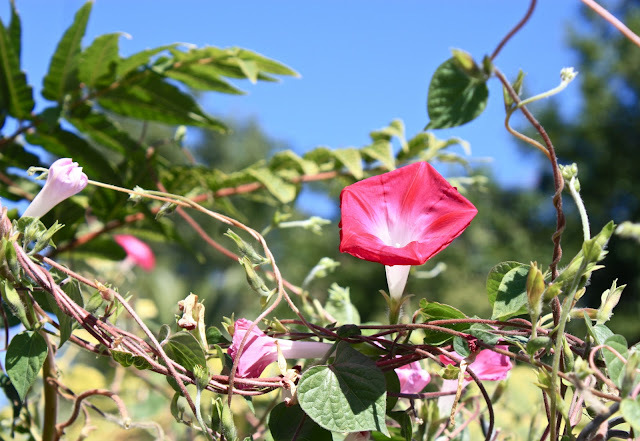 You bloom where you are planted! And beautifully! Love the bright color on you. So striking. I love that you started a street style blog (and for Sacramento!!) Those are really some of my favorite types of blogs for pure organic spontaneous style, and I was just in Sac last weekend and saw some great great style so I am sure it will be a huge success! Good for you! 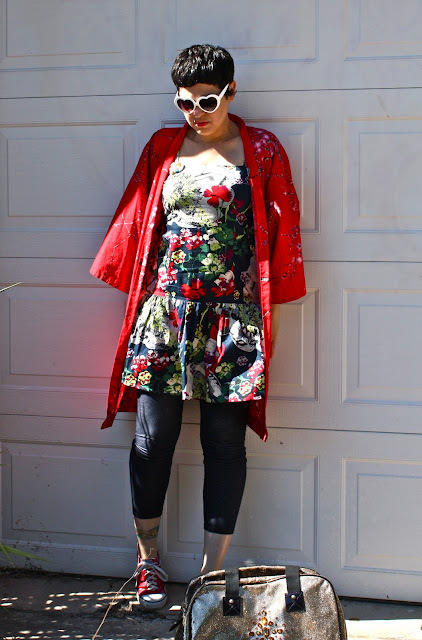 NOW about this Kimono: I got one last weekend in my great haul, and am blushing over how perfect and soft and colorful and beautiful it is, but have put it on a pedestal and made it feel too special I think. THEN here you are just rocking one like a cardigan, no cares in the world, nonchalance, effortless cool. THAT is how you wear a kimono I understand now. And I completely agree with you that just taking a shot, even in less than Ideal settings, is beneficial and can actually surprise you! I think these look great and juxtaposed with the found flowers, they are totally cohesive and beautiful! Lastly, your comments have such a huge impact on me. You are a very giving and loving person. your perspective and support are greatly appreciated. Many and profuse thanks for all you have done for us, Dear Internet Friends.Adorable! They make me smile! :DYou are indeed most super fantastic and will be missed!